What is your mantra, the underlying thought of your life? Mantras often guide us on our path. And for that reason, they’re worth considering today. The Merriam-Webster Dictionary defines mantra as a sound, word or phrase repeated by someone who is praying or meditating. It’s also explained as an often repeated word or phrase that expresses one’s basic beliefs. As a child, I knew nothing about mantras. But I did think a lot and I knew the feeling of happiness. For me, nothing else compared to being happy. 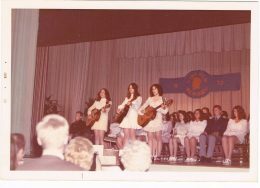 A friend resurrected the above photo from our 8th grade graduation ceremony, an historic moment for our 1972 class. We were exiting familiar classrooms and heading into a broader phase of social and academic growth. Weeks were devoted in preparation of this ceremony. We practiced songs, memorized poetry and recited patriotic prose before learning where to stand, sit and file. Everyone engaged in the songs and recitations, but each student also played an individual role. As I gazed at the photo of my 14-year-old self situated between childhood friends Lori and Susan, I smiled in remembrance. We were singing a song I’d written, a mantra that would guide my life and compass my journey into adulthood. The tune would never reach the Top 40. It was likely forgotten before we filed out of the auditorium. But by incorporating the most basic of chords and a simple melody to match, I developed a song that captured my own life mantra. “Be a person, happy and free. Be a person who loves openly. Be a person who’s happy to grow. Simply put, these words were my mantra. 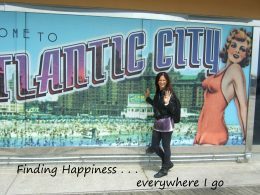 I greatly valued happiness and I truly wanted to be free. A major component of my happiness ideal was envisioning a better world in which welcoming, valuing and celebrating each other would become the norm. I couldn’t imagine reserving such bliss to a lofty, rarified or accidental occurence. Why would others deprive themselves of collective joy? Growing up with a life mantra has not always been easy, but its intonation helped guide my path. Decades later, I’m inspired to see how ideals contained in a childhood song have evolved, crystallized and materialized. Today I feel joyful, free and bigger, even as I’ve continued to embrace and include the world. The more I learn, grow and make friends here and elsewhere, the more my heart expands in like manner. I continue to find and create venues where people welcome, appreciate and celebrate one other. If you haven’t considered creating a mantra, maybe now is your moment. Choose to lead yourself to outcomes that benefit you and others around you. To hear a podcast I fittingly called The Song of Your Life, click here or on the podcast cover above. May it fuel your childhood aspirations and empower you to develop a life mantra of your own. Remember that glory beckons — and the world awaits the shining forth of you! I do have a prayer that I repeat over and over, actually, two of them. They are kind of personal, so I won’t share them here, but they do reflect how I try to live my life. Thanks for writing, Ann. I hope whatever your prayers may be, they are bringing you joyful outcomes. Those are some deep goals for a 14 year-old, but a great mantra to live by/strive for.